Smoking ban one month in – what do Russians think? New study shows that most Russians support the anti-tobacco laws but don’t think they will be effective. 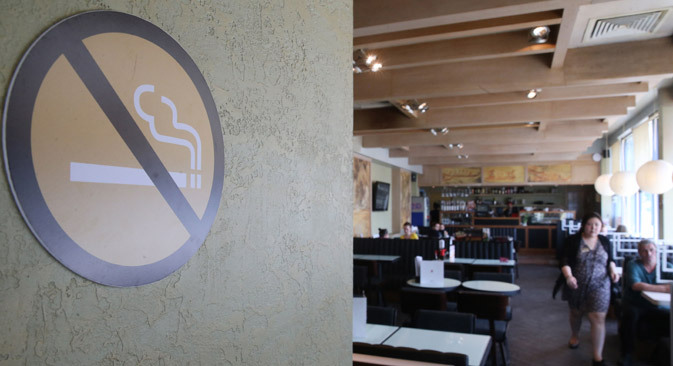 On June 1, 2014, a strict anti-tobacco law came into effect in Russia, banning smoking in cafes, restaurants, hotels, marketplaces, trains, ships, and other public spaces. On July 15, leading Russian opinion research center VTsIOM published the results of a study revealing how Russian citizens were reacting to the new laws and whether or not they believed the laws would be effective in restricting smoking in Russia. The study was carried out on July 5-6, 2014. It consisted of 1,600 participants from 160 cities in 42 of Russia’s 83 regions and republics. Ninety percent of the study’s participants reported that they were aware of the new smoking ban. Of these, 58 percent know the specific details of the law, and 32 percent reported having only vaguely heard of it. Three-quarters of those who were aware of the new anti-tobacco law knew that it is now forbidden to smoke in public places. But only 14 percent knew that it was now illegal for stores to advertise cigarette packs and only 6 percent were aware that violators of the law were subject to fines. Seventy-four percent approve of the law making it illegal to smoke in public places and 67 percent approve of the law making it illegal for stores to advertise cigarette packs. However, over half of the participants (56 percent) believe that the laws will not be effective in restricting smoking in Russia. This view was especially held by men (63 percent) 18-24 year olds (63 percent), and supporters of the right-wing Liberal Democratic Party of Russia (71 percent). Of the 35 percent of participants who believe the laws will curb smoking, 41 percent have a higher education, 42 percent are in a high income bracket and 42 percent live in Moscow or St. Petersburg. Demographically, men and active internet users were the most well-informed regarding the smoking ban, but women, elderly people, and millenials in large cities most frequently supported all of the anti-tobacco laws. According to a study published in January in the Journal of the American Medical Association, 39 million Russians smoked, out of a population of 143 million. Just over half of Russian men smoke every day, or 52 percent, the sixth highest proportion in the world. For comparison, 38 million Americans smoke out of a population of 319 million.